UMe is celebrating the music fanatic’s favorite holiday, otherwise known as Record Store Day (April 13), with a slew of must-have special releases from a wide range of world renowned artists spanning rock to hip-hop and everything in between. This year’s exciting haul of limited edition vinyl platters includes first-ever vinyl pressings, unique color variants, reissues of long-out-of-print albums, exciting rarities, one-of-a kind picture discs and new collections specially made for the record shop extravaganza. All releases will be available at Record Store Day-participating record stores on Saturday, April 13. Visit RecordStoreDay.com for more details and to find your local shops. Full details for all releases below. Us And Us Only is the sixth album by British alternative rock band The Charlatans UK. The album was first released in 1999 and hasn’t had a reissue until now. The album includes three top 40 hits “Forever,” “Impossible” and “My Beautiful Friend.” This Record Store Day exclusive comes on limited edition transparent vinyl. Charlie Parker With Strings: Alternate Takes is a glimpse inside the heart and mind of one of the most inventive saxophonists of all time. His original Strings LP, containing brilliant and unexpected interpretations of standards and first issued on Mercury in 1950, was a landmark in the cross-section of jazz and pop – and remains Charlie “Bird” Parker’s best-selling recording. Now, for the first time on vinyl, are the rarest Birds: alternate takes from the sessions, issued during the 70th anniversary year of the initial recordings. Discovered deep in the Verve vault and previously released on CD only as part of a “Deluxe Edition” set, they provide a glorious new chapter in the glorious history of the one and only Charlie Parker. And the vinyl, a bright blue matching the “new look” cover featuring the original album’s David Stone Martin illustration, is exclusive to Record Store Day customers. 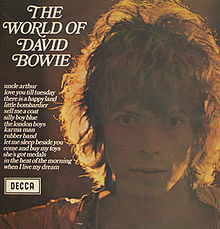 Decca launched its much-loved World Of Series in 1968. The first album set out the series’ stall perfectly, looking at one of the label’s biggest selling artists – yet hardly one that chimed with the counter culture in 1968. The World Of Mantovani – SPA 1, (or PA 1 in mono) – was a 14-track collection, each track a different selection from his sizeable Decca album catalog. Released in the autumn of the year, it acted as a perfect primer, and its price, 17s, put it shy of the 37s 6d of the full price albums. Its whole purpose was to drive sales of the artist’s deeper repertoire – dip in here and then indulge further – the rear sleeve clearly offered the catalog numbers of the parent albums. Def Leppard, Britain’s greatest arena rock band, are set to release The Story So Far… an album of the band’s greatest hits and songs from their illustrious career. This Record Store exclusive presents the second disc of the CD album on vinyl for the first and only time. Having sold over 65 million albums worldwide since their debut release in 1980 and proved themselves one of rock music’s hardest working and consistently powerful live bands (playing to over 50 million fans in the last 15 years alone), Def Leppard remain one of only five rock groups who can claim two separate original 10 million plus selling albums in the US (Pyromania being one of them). The others are The Beatles, Led Zeppelin, Pink Floyd and Van Halen. The band are doing selective festival dates in Europe over the summer including headlining the iconic Download festival in June. The rare 1987 guitar-centric compilation, The Guitar World According To Frank Zappa, originally available only on cassette through Guitar World magazine and Barfko-Swill mail order, will receive its first-ever vinyl pressing. The album features unique mixes and edits by Frank Zappa and a selection of solos that were released the following year on the Guitar album. Mastered by Chris Bellman at Bernie Grundman Mastering, this RSD First release, limited to 8000 worldwide, is numbered and pressed on 180-gram clear audiophile vinyl by Furnace MFG. One of the many highlights of John Lennon’s Imagine – The Ultimate Collection, the immersive and intimate super deluxe edition of his legendary solo album, released this past October on what would have been his 78th birthday, were the Raw Studio Mixes. Helmed by engineer Rob Stevens under the supervision of Yoko Ono Lennon, these aggressively visceral and emotionally touching mixes capture the exact moment Lennon and The Plastic Ono Band recorded each song, raw and live on the soundstage at the center of Ascot Sound Studios, at John & Yoko’s home in Tittenhurst. The Raw Studio recordings are devoid of the effects (reverb, tape delays, etc.) that were added when co-producers John, Yoko and Phil Spector created the additional layers of production sound and added John’s orchestral arrangements in New York. Exclusively for Record Store Day Imagine – Raw Studio Mixes will be released on vinyl for the first time as a limited edition Record Store Day First release, pressed on audiophile grade 180-gram black vinyl. Previously only available in the Imagine—Ultimate Collection box set, these raw studio recordings reveal whole new levels of sonic depth, definition and clarity to these timeless songs. Marty Stuart’s 2012 compilation album Icon will be released on vinyl for the first time ever. The record will be limited to a pressing of 1500 copies and will include Stuart’s hits “Tempted,” “Hillbilly Rock,” and “Till I Found You.” Each album personally autographed by Marty Stuart. People of Record Store Day! It is customary at this time for us to release a record from our archives, and we have decided to WELEASE BWIAN! To celebrate Record Store Day 2019, and the 40th anniversary of the film, Monty Python will release a very special, limited edition vinyl picture disc version of Monty Python’s Life Of Brian soundtrack – mastered at Abbey Road Studios. Complete with new artwork, overseen by Terry Gilliam himself, and unseen material from the Monty Python archive. Includes download voucher. The soundtrack to the 1999 cult classic Office Space is now out on vinyl! Featuring tracks from Ice Cube, Geto Boys, Slum Village and more on a stapler red 1LP. Following on from “Roxanne” – RSD 2018, we celebrate the 40th anniversary of the band’s first international no. 1 single, originally released September 1979. Brand new exclusive edition for RSD 2019, packaged in bespoke 2 x 7” special double pack gatefold sleeve. Utilizing original green UK sleeve for front and incorporating blue US “poster” sleeve inside the gatefold. Two color inner bags – A&M “company” bag design. Features the original single and B-side. Disc 2 features “Message In A Bottle (Classic Rock Mix),” originally exclusive to Every Breath You Take: The Classics’ Collection (1995) –now deleted, and the previously unreleased instrumental version of “Message In A Bottle.” Remastered at Abbey Road Studios, London and pressed on colored vinyl: Disc 1 – “bottle” green vinyl, Disc 2 – blue vinyl. This exclusive double 12” edition grew out of mixes that were undertaken to celebrate the release of the Super Deluxe version of Roxy Music’s debut album in spring 2018. Unused at the time, the mixes, overseen from Bryan Ferry’s London HQ, celebrate the essential otherworldliness of Roxy Music’s space age vision, stardate 1972. This strictly limited double 12” features out-takes of Karl Stoecker’s legendary photo-session from the debut and was mastered by Frank Arkwright at Abbey Road in Autumn 2018. First reissue of the 1978 picture disc edition of Hemispheres continuing to celebrate the 40th anniversary of Rush’s iconic album. First ever highlights compilation of the Everything Under The Sun rarities box set, pressed on red and yellow starburst color vinyl. U2: The Europa EP, a new 3-track EP, will be released to celebrate Record Store Day. The Europa EP: Side A features an exclusive new mix of previously unreleased material from U2’s recent eXPERIENCE + iNNOCENCE Tour: Charlie Chaplin’s electrifying speech from the movie The Great Dictator (1940) underscored with a mash-up of Songs Of Experience album track “Love Is All We Have Left” and 1993 classic “Zooropa,” leading into a performance of “New Year’s Day” recorded live in Dublin on November 5th last year. The EP cover art is a Chaplinesque homage to the Europe-themed artwork of U2’s 1993 album Zooropa and features the figure 130, in celebration of Chaplin’s 130th birthday which falls on April 16th, 2019. First ever vinyl pressing of Weezer’s BLUE album’s Deluxe bonus tracks including B-sides, rarities, alternate mix of “Say It Ain’t So” and demos.